After having a fun at the beach, maybe enjoy a snack and refreshment before tippy toeing to the a very large outside wooded deck where you can relax over a refreshing drink and get the barbecue started. There are beautiful upper deck views from the top outdoor entertaining area where you can slip into the outdoor spa after dinner. 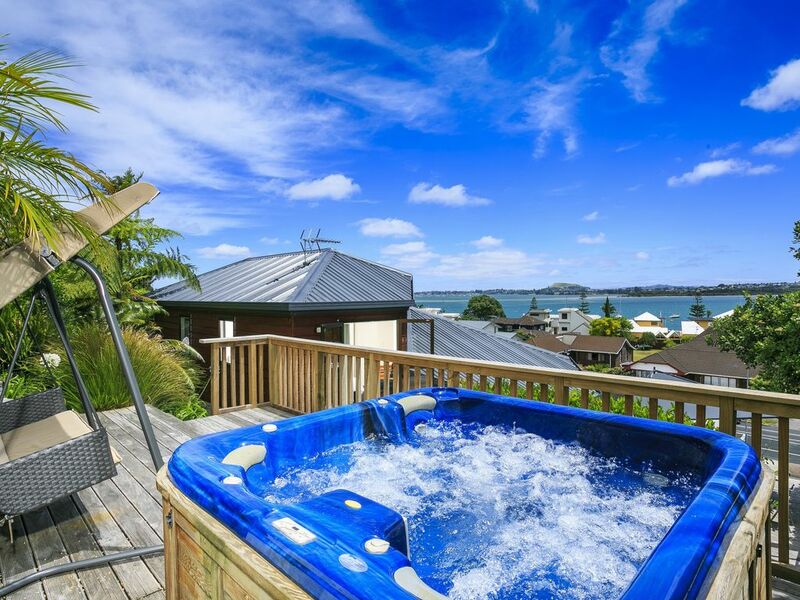 The property is 30-minutes drive away from Auckland international airport. There are free private parking on-site. Only 3-minutes drive to Half Moon Bay, guests can take the ferry to the Waiheke or Auckland City habour , enjoying the fantastic harbor view! Buses also access directly to the CBD. The property close to Golf course , easy driving to the supermarket, yacht club, cafes and restaurants. Please keep the room tidy, Leave kitchen/dining/ lounge areas as you found it. No shoes inside the house. No loud noise during the night. No house parties. No smoking (outside please) and no pets. No illegal anything. Please love our house as your own home! Extra fee will have to be charged if the key was lost. Number of guests to match the number in your booking. Location was fantastic as was the cleanliness of the property. There was no shortage of amenities and all of the bedrooms and bathrooms were faultless. A nice touch was the Christmas tree that was left in the house as we were spending Christmas away from home, along with the 2 small gifts that were left underneath. Very appreciative of Grace's thoughtfulness. It was also nice that all of the bathrooms had a good supply of liquid soap and ample toilet paper for our stay. Soak in spa enjoying fantastic views and relax in spacious comfortable home. A great home for our family weekend - room for 9 adults with plenty of privacy. Spa pool with fantastic view over Half Moon Bay was very popular. Great views from house with wonderful decks for outside entertaining. Cant wait for our next get together as will definitely use again if available. Very comfortable spacious and quiet. Great location with cafe along the road and bar with views of water. Great walks including round to Marina where plenty of restaurants and also the ferries. Awesome place with a beautiful view. This place is wonderful with a beautiful view!